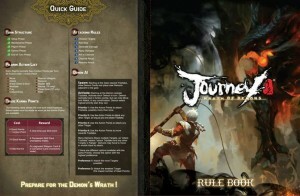 Marrow Production is showing off some preview shots of the Journey rulebook's layout. Who else is incredibly excited for this game? It is with our great pleasure, we would like to present the first part of our rulebook to you. The full version PDF rulebook will be available to download in our KS update later this week. Thank you!